The small cascading indoor tabletop water fountain with lights and the soothing sound of trickling water it creates is indeed a great stress reliever besides having a calming effect on your nerves. You get the feeling of having a gentle flowing stream right inside your home and brings you closer to nature; sound of water, mossy stone, wood and all. Such a gift would make a wonderful housewarming gift for the tired new owners. Besides, it is also a beautiful decorative item. These zen looking LED tabletop waterfalls with lights are pleasant and therapeutic setting the perfect ambiance for a calm and serene atmosphere. These indoor LED fountains with their soothing effect make great gifts for office colleagues too. There are so many types of tabletop indoor water fountains. You can get a 2 tier tabletop lighted water fountain, 3 or 4 tiers as well with the larger ones reaching 6 tiers. Or you can get one with a decorative sculpture such as the Buddha stone hand water fountain, a staggered rock waterfall to add instant charm and peace to your room. 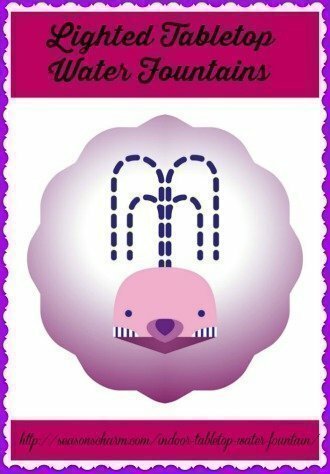 You can use a fountain cleanser to keep your fountain free from molds, lime scale, calcium build up or organic contaminants. Always ensure that there is enough water to cover the submersible pump at all time to minimize splashing of water and the noise from the pump. Gifting a lovely unique tabletop indoor water fountain is indeed a wonderful idea. Check out these waterfall fountains with soothing cascading water features that can easily blend into any home decor bringing with them calm and peace. Featuring a rich brown, neutral red, gray and green coloring, this durable polyresin cascading indoor tabletop water fountain with lights comes with a one year manufacturer’s warranty. Measuring 11.75″ x 12″ x 11″ and weighing 7 pounds, this waterfall fountain is fitted with a quiet submersible electric pump that doesn’t drown out the soothing and relaxing sound of the cascading bubbling water. This electric-powered indoor water fountain with built-in LED lighting doesn’t come with an on/off switch. You have to unplug it to stop the water flow. If you prefer a fountain with hardly any water sound, then this is the fountain for you. It adds a natural soothing outdoor look to your room decor. Measuring 7″ x 10.5″ x 4.5″ and weighing just 3 pounds, this cascading water fountain comes with a quiet submersible electric pump. There is a one year manufacturer’s warranty. Made of durable polyresin, this 3 tiered indoor tabletop fountain with LED lights comes with an included pump that has a maximum flow of 47 gallons per hour. Add this LED lit cascading fountain to your room for a soothing and calming ambiance. The fountain comes with natural rocks and 4 numbers of white LED lights illuminating the cascading water truly offers a zen experience. The fountain measures 8.75″ (L) x 8.75″ (W) x 10″ (H). Polyresin tabletop lighted fountain with water flowing gently from one jar to another. Decorated with river rocks and a soft glow from the LED lights, this indoor lighted fountain works great as a calming decorative item. Included pump flows at a maximum flow of 47 gallons per hour. Zen stones stacked up on top of each other forming a pleasing and tranquil rock cairn fountain with gently trickling water. It measures 10″L x 9″W x 12″H and comes with a 6.5′ length cord. The pumps are UL certified. 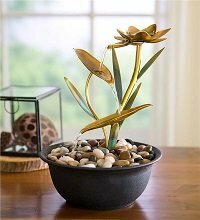 Having one of these in the home reminds one of nature and its peaceful surrounding. 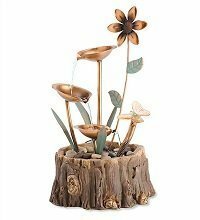 The LED color changing butterfly, lifelike resin stump with its smooth river rocks, a pretty daisy flower as well as the reeds, make this tabletop fountain a conversational piece. Pump (quiet) and electrical cord are included. It measures 8¾”L x 7½”W x 16¾”H. The fountain is made of cast stone resin with hues of brown and beige. Instead of LED lights, you get the illuminating soft glow of tealight candles (3 tealight candles are included). Putting in your favorite scented candles (standard size 1.5″ tea light candles) add to the overall soothing and calming effect of cascading stream of water. Rocks/stones are included for a more Zen feel. 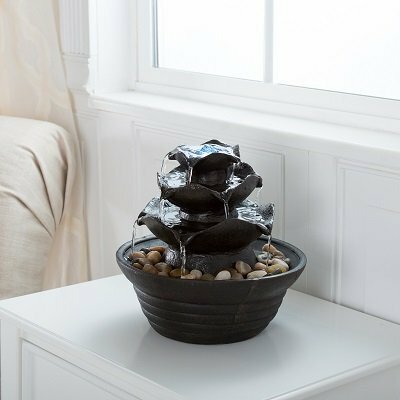 The fountain measures 9″L x 9″W x 11″H with a 1 year limited warranty. It doesn’t come with an on/off switch. Just unplug to stop the flow of the water. It doesn’t work with batteries, needs to be plug in to work. There are 4 items inside your package – the fountain top, fountain base, the submersible pump and the 3 candles. 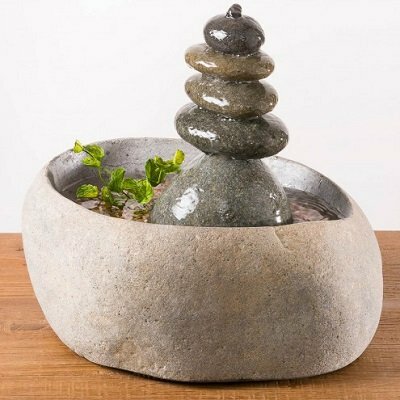 This lighted tabletop rock fountain is made of fiberglass and has a natural gray stone look. A zen fountain with water gently cascading down and illuminated with LED white lights create the right atmosphere for meditation. This mutiple stream waterfall fountain measures 9″L x 7″W x 13″H and weighs about 8.4 pounds. There is a one year limited warranty by the manufacturer. Water trickles down from the shiny metal lotus flower at the top, cascades down from one leaf to another and ending up in a resin bowl of river stones. The golden metal lotus flower and green patina metal leaves remind you of the beautiful lotus flowers floating in the pond. It comes with a quiet pump and electrical cord. Measuring 7.5″ diameter and 10″ in height, this golden lotus flower tabletop fountain sure does bring back nostalgic memories in the country side. It adds a cheerful charm to your modern home.